Historical medical journals provide unique perspectives on the development of expert understanding of transmission, morbidity, and impact during an epidemic. Examining the ways that medical journals contributed to the spread of information, evaluation of interpretations, and creation of new knowledge in a specific historical process can contribute to current discussions about the relationship between expert perspectives and public understanding. Information on the Russian Influenza (1889–1890) in the British Medical Journal offers an excellent case study for evaluating historical significance and contemporary relevance. Circulating Now welcomes guest bloggers E. Thomas Ewing, Ian Hargreaves, Jessica King, Andrew Pregnall, and Tyler Talnagi who examine different dimensions of the role of medical journals in collecting, presenting, and interpreting knowledge of a disease outbreak in this second of three posts for our ongoing Revealing Data series. The January 1890 issues of the British Medical Journal included several reports on the Russian influenza epidemic in European and British locations that combined summary analysis of the spread of the disease, first-hand accounts from physicians, and statistics on cases and deaths. This post examines the quantitative evidence presented in three British Medical Journal issues as a case-study of how a medical journal revealed data about influenza deaths as a means of communicating information about this epidemic while it was occurring. The statistical information included several reporting categories as well as methods of calculating and reporting changes. These statistics primarily deal with mortality, meaning the number of deaths associated with the epidemic, and include four main categories: total number of dead, number of deaths from diseases associated with influenza, death rate per 1,000 of the population, and deaths reported on a weekly basis. These methods were designed to address key issues recognized as critical for measuring the impact of an epidemic, including influenza as a primary or secondary cause of death, identifying unusual levels of mortality associated with influenza, and defining periods of time long enough to allow for variation yet short enough to make comparisons. Reporting on the number of deaths during a week, for example, overcomes potentially misleading fluctuations when deaths are reported daily, yet also allows for meaningful comparisons that show significant change over time. Reporting deaths per 1,000 people makes it possible to compare the impact of the epidemic in different geographical regions in ways that would be obscured by measuring total deaths, while also allowing for comparisons to average death rates over a period of time to document change. Comparing the number of deaths from influenza to other related diseases, including respiratory diseases more generally as well as specific diseases such as pneumonia, allows for recognition of the fact that influenza was, and still is, often a secondary cause of death, with the primary cause being a related disease that is more deadly when victims have been compromised by the influenza. The statistics about Vienna, Paris, and London published in three successive issues of the British Medical Journal represent a small fraction of the total reporting of this disease, yet it shows how statistics were used to make sense of the epidemic at its peak and also as it began to decline in intensity. In these articles, the statistics were embedded in the text, which requires careful reading to distinguish quantitative data from other kinds of reporting, including identification of symptoms, discussion of how the disease spreads, and possible treatments. Converting the statistical information embedded in texts into charts makes it possible to see change over time, compare rates, and identify causation. Figure 1. 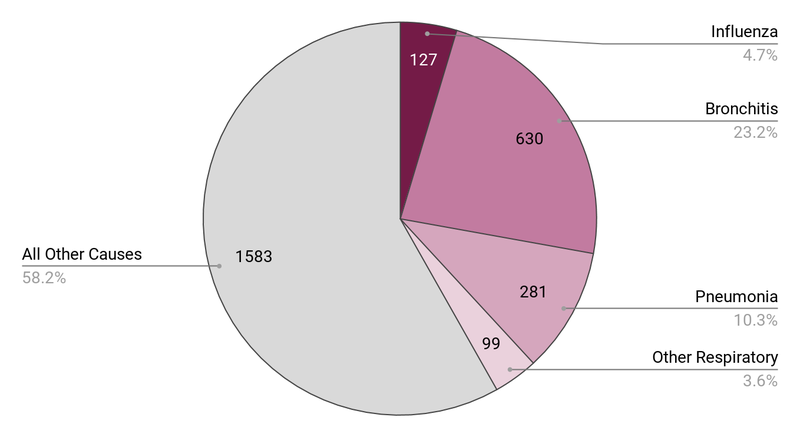 Total deaths from all causes and from respiratory diseases, weekly, November and December 1889, Vienna, from “The Epidemic of Influenza,” British Medical Journal, Issue 1515, Vol. 1, January 11, 1890, pp. 95-98. 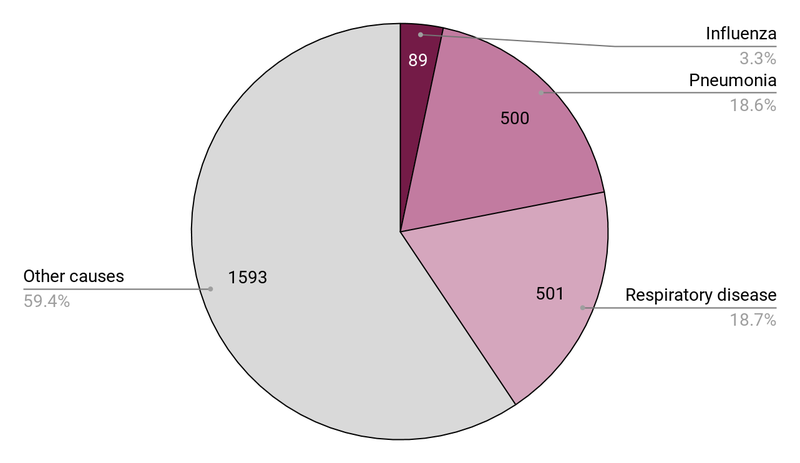 Using statistics published in a report on Vienna, Figure 1 illustrates how the number of deaths from all causes and the number of deaths from respiratory diseases increased in parallel during the final eight weeks of 1889. 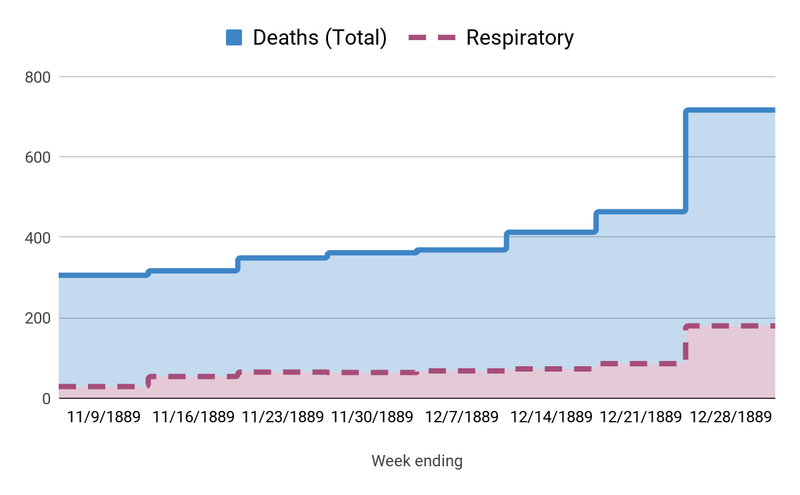 Even though the deaths from respiratory diseases increased significantly during the week ending December 28, 1889, the number of deaths from all causes rose even more significantly, as indicated in the chart, which suggests that the epidemic contributed to a higher toll of deaths from causes other than respiratory diseases. Figure 2. Rate of deaths from all causes, compared to rate from similar weeks in 1889, Paris, December 1889 and January 1890, from “The Epidemic of Influenza,” British Medical Journal, Issue 1516, January 18, 1890, Vol. 1, pp. 146-150. 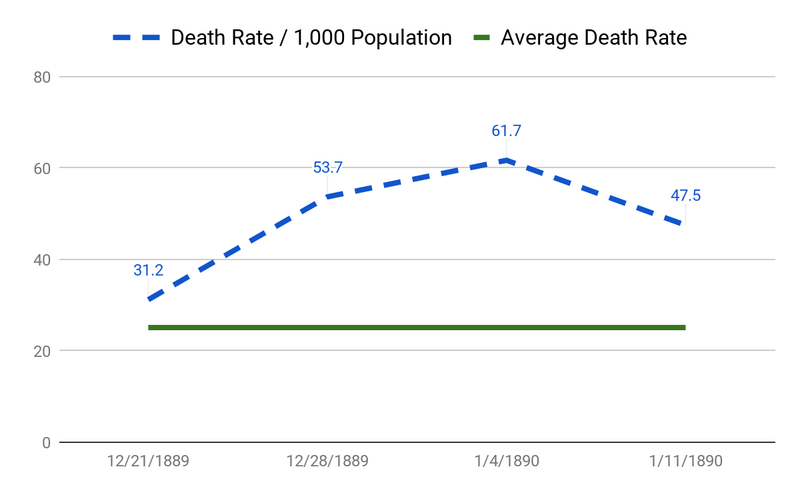 In Figure 2, the average death rate for weeks in December 1888 and January 1889 is compared to the sudden increase in death rates in Paris at the height of the Russian influenza. As indicated in this chart, the death rate doubled from the third week of December to the first week of January, yet was already declining by the time this report was published in the January 18, 1890 issue of the British Medical Journal. Figure 3. Cause of Death, Week ending January 4, 1890, Paris, from “The Epidemic of Influenza,” British Medical Journal, Issue 1516, January 18, 1890, Vol. 1, pp. 146-150. Similar changes are revealed in Figure 3, which compares the death rate from all causes with the total number of deaths from respiratory diseases for London. 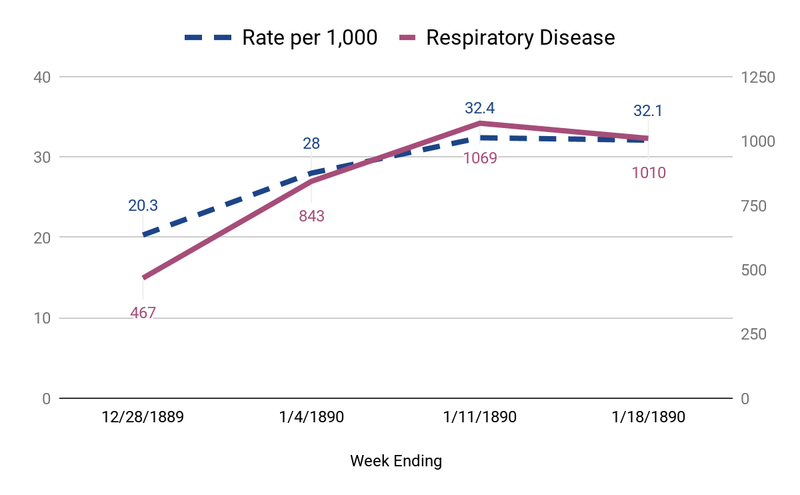 The significant increase in both death rates and total deaths from respiratory diseases from the last week of December through the second week of of January, suggests that most of the increase in total deaths was due to higher numbers of respiratory deaths. As these charts indicate, understanding the impact of the epidemic depended on a full understanding of the relationship between different causes of death. Figures 4 and 5 compare reports on causes of death in Paris and London during a particular week of the epidemic. Both charts indicate that influenza was the direct cause of a relatively small proportion of deaths (3.3% in Paris and 4.7% in London). In both cities, much higher proportions of deaths were caused by pneumonia (18.6% in Paris and 10.3% in London) and other respiratory diseases (18.7% in Paris and 26.8% in London). Combining these categories indicates that nearly one-half of all deaths during these weeks could be attributed directly or indirectly to the influenza epidemic. Using contemporary tools to visualize these statistics allows for new ways to use data from the past to reveal patterns of historical change and causal relationships. Yet these statistical reports and the data visualization raise questions that cannot be resolved using just this quantitative evidence. In each case, understanding how the epidemic affected the total number of deaths, the death rate, and the pattern of deaths by specific causes all requires more research on how these categories were defined, recorded, and changed over time. For the historian looking back on this evidence, as much as for the physician or epidemiologist at the time, counting victims was an important means for making sense of the epidemic of influenza.